Located on the southwestern shore of Lake Kumdikol, 30 km southwest of the town Kokshetau. The compositions of rocks is (from the bottom upwards): garnet plagiogneisses, garnet-biotite gneisses, plagiomagmatites, garnet-muscovite shales; garnet-muscovite leucocratic granites and gneiss-granites; garnet-biotite and biotite gneisses, quartz microgneisses with interlayers of calciphyries, boudinages of eclogites, and bodies of garnet-pyroxene rocks; garnet migmatites and plagiogneisses; garnet-muscovite, muscovite-biotite and muscovite shales; eclogites and amphibole eclogites.The thickness of the rocks is around 1000m. There is a discrete zone containing most of the diamonds and beyond it the content drops. The orebody occurs as a flattened, lens-shaped body that extends southwesterly. Diamonds' distribution is uneven. High grades are confined to graphite quartz-sericite-chlorite, quartz-pyroxene, pyroxene-carbonate and other metasomatites. Areas with high concentration of diamonds are separated by low diamond content or without diamonds. Most of the diamonds are associated with garnet; a little amount is found in biotite; rare crystals are present in pyroxene, amphibole, quartz, ziosite and muscovite. Diamonds often occur at the contacts between different minerals. Kamdykol diamonds are small and have different morphological properties and mostly contain cubic crystals.85 per cent of the diamonds have a size of less than 50mcm. Large crystals have been found: 0.5-1.65 mm crystals in eclogites; octahedra over 1.00mm in garnet-pyroxene rock; 2.95 mm crystals were found in sands from Kumdykol lake. The cubic crystals have yellow-green colour; octahedral crystals are water transparent; spheroids are pale yellow. Some crystals display weak luminescence. Kumdykol diamonds contain sodium, aluminium, antimonite, arsenic, gold, potassium, chromium, manganese, rare earth minerals. 30 valid minerals. 2 (TL) - type locality of valid minerals. 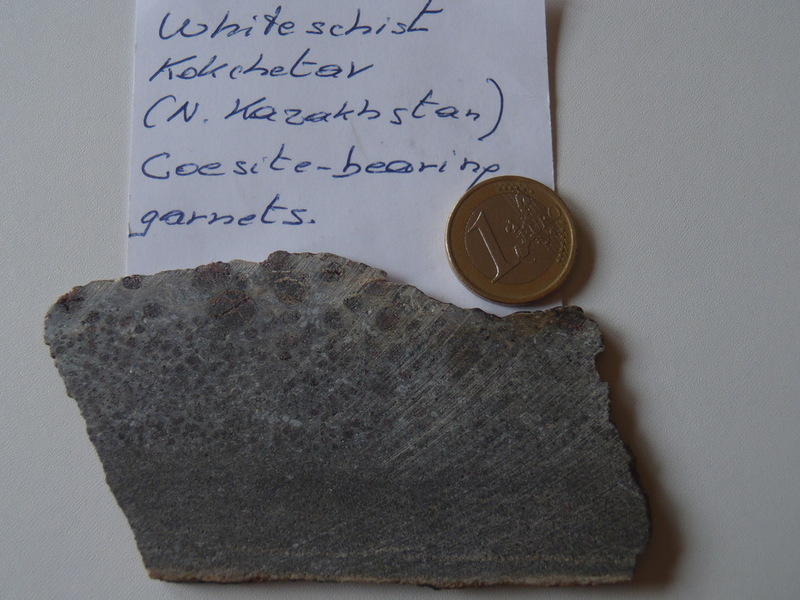 - De Corte, K., Cartigny, P., Shatsky, V.S., Sobolev, N.V., and Javoy, M. (1998): Evidence of fluid inclusions in metamorphic microdiamonds from the Kokchetav massif, northern Kazakhstan. Geochimica et Cosmochimica Acta 62(23/24), 3765–3773. - Erlich, E.I., and Hausel, D.W. (2002): Diamond Deposits: Origin, Exploration and History of Discovery. SME Publishing, Littleton (CO), USA, pp. 179-190. - Dobrzhinetskaya, L.F., Green, H.W., Bozhilov, K.N., Mitchell, T.E., and Dickerson, R.M. (2003): Crystallization environment of Kazakhstan microdiamond: evidence from nanometric inclusions and mineral associations. Journal of Metamorphic Geology 21, 425-437. - Nitsenko, P., and Ussoltsev, I.I. (2004): The Kumdy-Kol diamond deposit (north Kazakhstan): The geology and the origin of metamorphic diamond. Earth Science Frontiers 11(2), 333-338 (in Chinese with English abstract). -Abdulkabirova M.A., Zayachkovsky A.A. (1997): Diamond of Kazakhstan Reference book. Mineral resources of Kazakhstan, pp 17-21.